I am sitting here staring out the window at a white Chevrolet Impala. Staring, because it is much more than a car to me. It is a time machine that takes me back to my childhood; back to days when a car said as much about a family as did the house they lived in. My dad was pretty much a Buick man all his life. My wife’s dad was a die-hard Ford man. But my mom’s brother, Jarrel (like”barrel”, but with a J…another one of those names a Kentucky momma comes up with), was a Chevy man. By the way, GM tells us that we’re not supposed to refer to a Chevrolet as a Chevy anymore, but I haven’t heard the final word on that from all the Chevy owners I know. I’ll get back to you when I do. I could take this opportunity to relay to you a bunch of impressive technical data on the Chevrolet Impala…like the two V6 options, or the voluminous trunk and passenger compartment, or the safety features and superb riding and handling characteristics, all of which you know from the Impala’s illustrious history and legendary reputation. 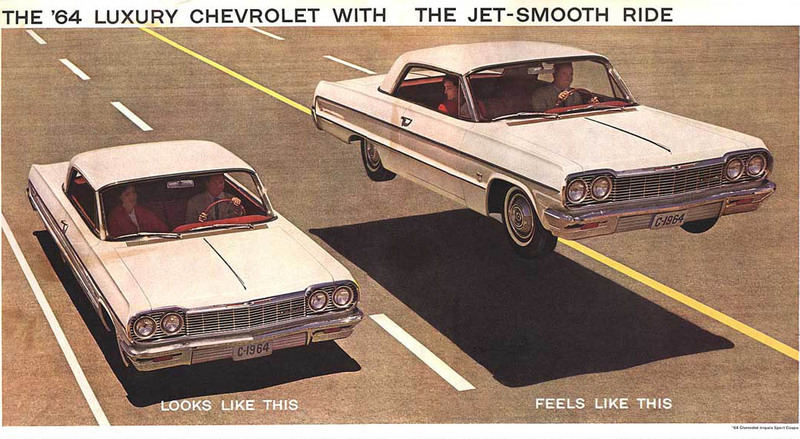 Instead, I will take you back to the days when I was a kid in the ‘50s and ‘60s…and to my Uncle Jarrel’s Chevy Impalas. 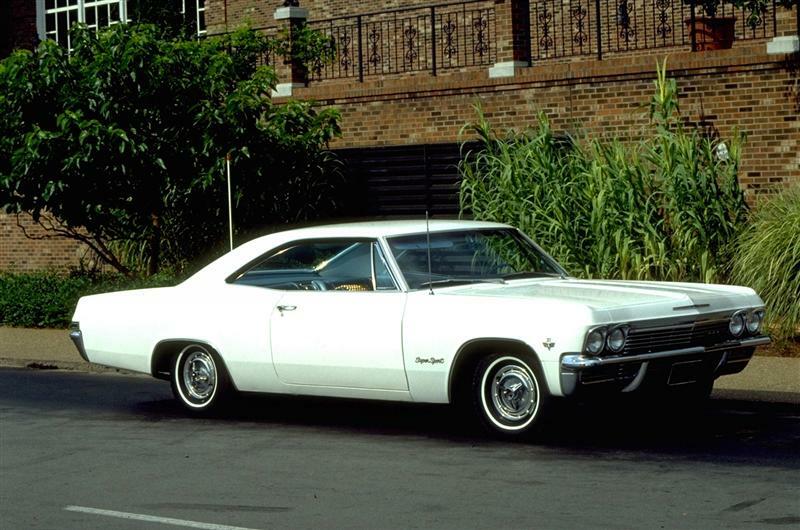 There were lots of Impalas roaming the streets of America in my day…’55s, ‘57s, ‘64s…but there was only ONE Uncle Jarrel. My dad was born in Coshocton, Ohio, to a coalminer family. He looked enough like Harry Morgan (Col. Potter on the TV show MASH) to be his twin brother. Mom was born into a farm family in Flemingsburg, KY. Fortunately, she looked nothing like Harry Morgan. Both families were very close, and so was our family when I was growing up. To this day my 3-year younger brother and 8-year younger sister and I are as close as we were back home in Indiana. Uncle Jarrel was one of my heroes. He looked a lot like Porter Wagoner, the Grand Ole Opry host. He was in the carpet, drapery, and furniture business. He and was like my dad in that they had both been in the Army in WWII, and everything they owned had to be in good running order, neat, clean, military-square, and tip-top shape at all times. Whether it was his car or his closet, a thing was either right or it was not. If it was not right, it was straightened up, fixed, or replaced. And, like Dad, he was an insufferable jokester. Mom’s side of the family and Dad’s both laughed all the time. If there was nothing to laugh about, they would create something. 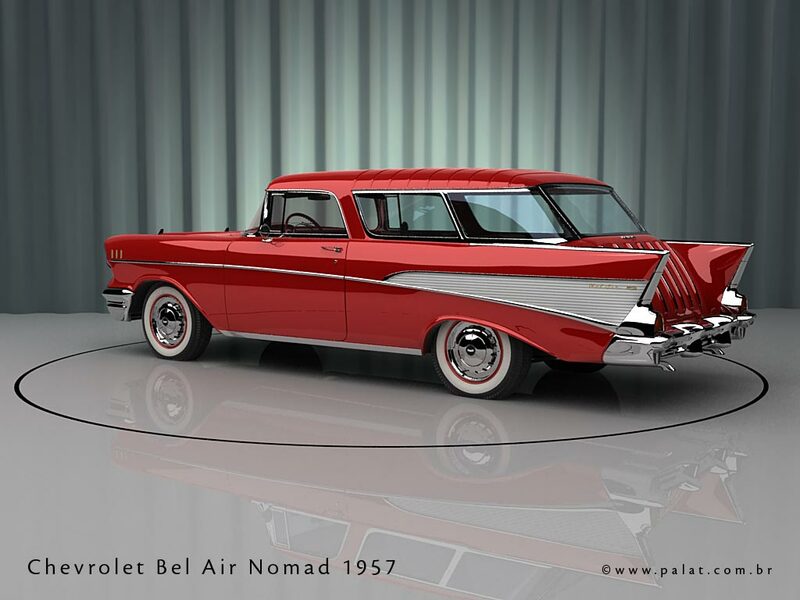 The only time Uncle Jarrel drove anything other than an Impala was when he bought a brand new 1957 Chevrolet Bel Air Nomad stationwagon. He drove it out to our place so Dad and Mom and us kids could gawk at it. “Plaza Carpet, Drapes and Furniture” was fancy-painted on the sides. All of us ran our hands over the car like it was a fine horse. Our family could not afford such a fine steed, but we were all happy for Uncle Jarrel and Aunt Barbara and their kids. We all worked hard for our money, and they had hit a long ball. We spent a couple of hours talking about the new car. What happened next was a source of belly laughs for the rest of their lives. When Uncle Jarrel got ready to leave, Dad snuck up behind the stationwagon and held on to the rear hatch handle with one hand, put both feet up on the rear bumper, held the other hand up in the air, and struck a pose like a rodeo bronc rider. Uncle Jarrel saw this in the rearview mirror and thought Dad was merely standing on the ground leaning behind the car. He started the engine and floored the pedal, expecting to see Dad let go and fade away in the mirror coughing up the dust of our gravel driveway. To our horror Dad came off the bumper as the hatch handle was jerked out of his hand and the car vaulted from under his feet. He turned a complete somersault in the air and landed on his fanny in the gravel, scooting about 15 feet. His landing looked nothing like the pictures I had seen in his 82nd Airborne scrapbook from WWII. Uncle Jarrel kept that stationwagon for seven years, and then bought another Impala..a brand new 1965. I was almost old enough for a beginner’s permit, and was struck by the look and feel of that Impala in a way I had never been struck before. For a teenager on the threshold of the freedom that only driving a car can give, that Impala kicked my imagination in high gear. What was it going to be like driving around town, winkin’ at the girls, pulling into the drive-in and ordering a malted shake (it never occurred to me that the girls would never wink back or that we wouldn’t have money for gas)? Like all Uncle Jarrel’s cars, this one was stark white, squeaky clean, and rode like a cloud. That Impala was so quiet you couldn’t even hear a semi as it passed. And when he pulled out to pass another car, well, clocks and watches actually ran backwards. I think riding in that Impala was the closest Dad ever came to hopping over the fence from Buickland to Chevyland. If DAD was impressed with a car, trust me, that pretty much settled the issue for ME, ‘cause I gaged my own opinions by my Dad’s. That ’65 Chevy Impala was one fine car. Probably the best car Uncle Jarrel ever owned. You’ve all experienced the eerie feeling of going back to your old grade school, especially if no one is there when you walk the halls. It’s almost as if you can hear the voices and laughter of childhood friends and teachers, and even see their faces looking at you just as they did way back then. Mom, Dad, Uncle Jarrel, and many others are gone now. And because we were all so close and spent so much time together, us kids have a mountain of memories to climb and look back from. But thank the Lord the Chevy Impala is more than just a memory, it is still in production. And everytime I see a white one, I can see Uncle Jarrel…and all the watches and clocks start to go backwards, and suddenly I’m cruisin’ around town, winkin’ at the girls, looking for a drive-in and a malted shake.